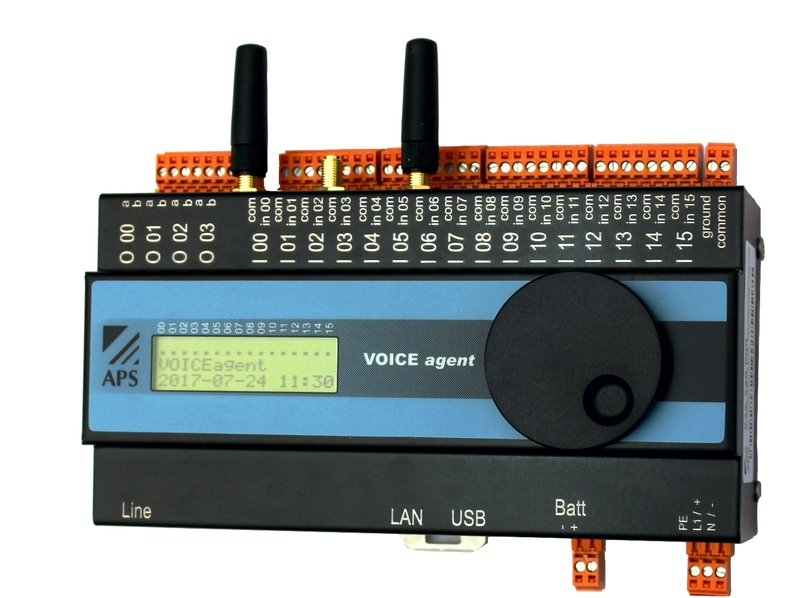 The VOICE agent remote alarming module is a compact device designed for DIN rail mounting with a 110-230VAC or 24VDC power supply. The VOICE agent is equipped with 16 iputs for 24VDC. 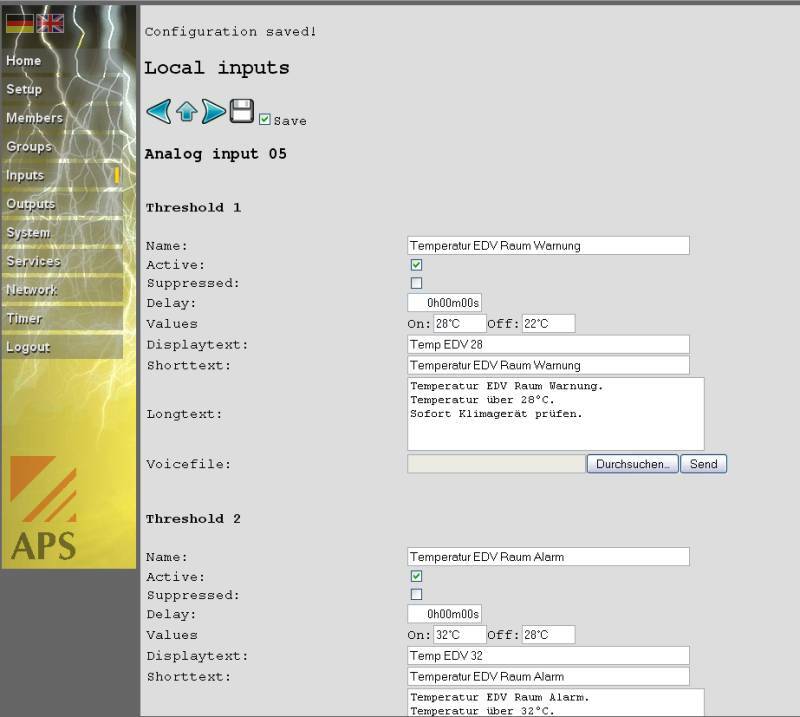 Up to eight of the inputs can be configured as analogue inputs. Against this are four digital relay outputs (e.g. collective- or hornoutput). With the LTE version the outputs can be altered by SMS. All operating states, the time, analogue values and communication activities are shown in the display. Of course, the VOICE agent is also a solution to expand an existing system. 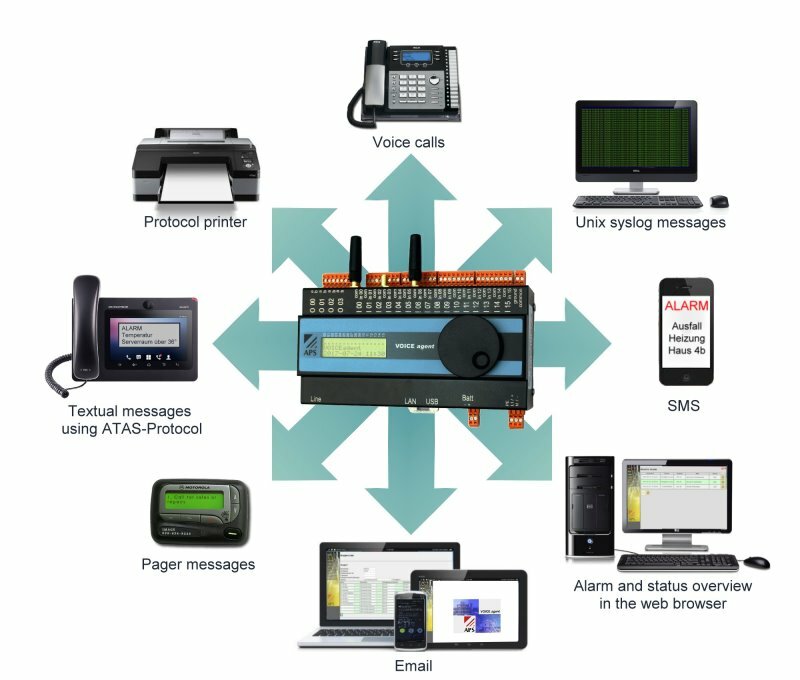 Voice messages are transmitted using the analogue or LTE telephone network. The subscriber line can be monitored so as to activate the system output should it be disconnected. A test message can be sent at periodic intervals to test device operation. If this message is sent by e-mail it includes the acutal values including the analogues. Calling the device provides the information if there are actually any alarms. All events are recorded in a log memory. This can be used to find out when an alarm arose and which subscriber acknowledged it. 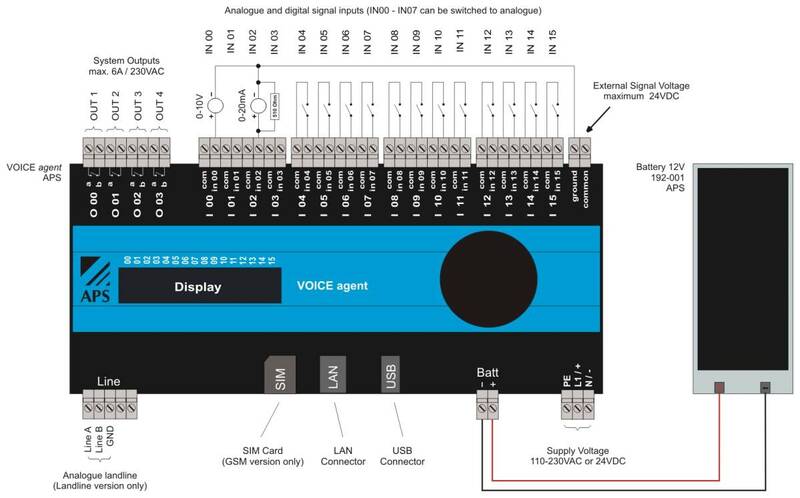 To ensure proper function during power blackout, the VOICE agent has an integrated battery charge controller for an external connected battery pack. The battery conditon is monitored. The actual status of the in- and outputs is visualised in the browser. Additionally, the value of analogue inputs is shown. 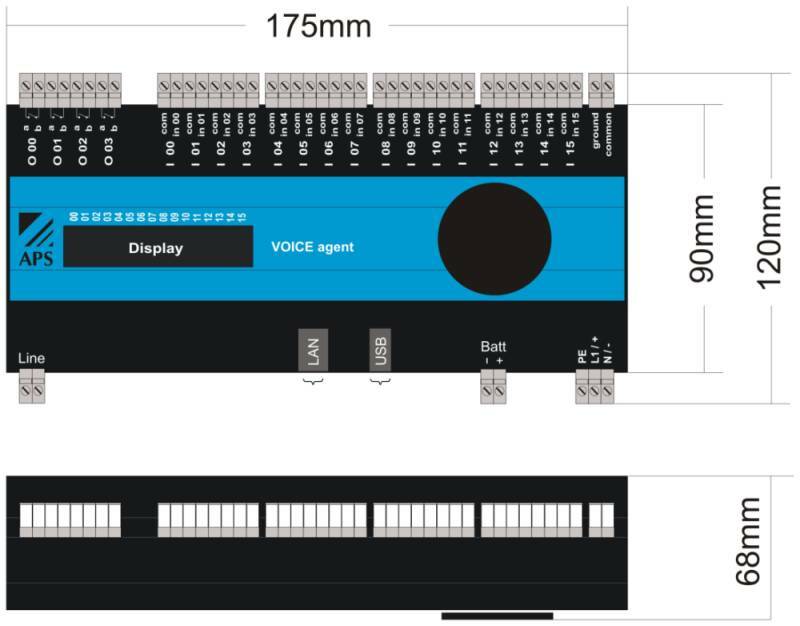 The use of the VOICE agent extension enables the upgrade of the monitoring- and controlling system up to 64 inputs and 52 outputs. Every extension module offers additional 16 in- and 16 outputs. A total of three extensions can be integrated over the network to the VOICE agent. Since all the programming takes place fully in the browser, there is no need to purchase software and updates. The configuration comes with graphics and is menu-based. 3 pikett groups are available for the alarm function, each having 10 subscribers. A separate language file can be specified for each of the 16 inputs. The fault message procedure is carried out in accordance to DIN 19235. Delay times for the inputs, triggering the alarm and also for the jump to the next subscribers in the alarm chain. Each subscriber in the alarm list can acknowledge the fault by entering a code (DTMF tones), thus stopping further processing of the list. Using the front mounted knob enables the setting of parameters like phone numbers of alarm recipients. This access is protected by an 4 to 6 digit code.